Gone is the day of mass production and mass communication. Digital transformation has introduced the 'Age of the Individual', where delivering a personalized experience can have significant revenue implications. How prepared is your financial institution for a new era where you will be asked to turn on a dime and deliver content, experiences, services, and technology to individuals however and wherever they desire? Oracle’s “The Era I Enterprise: Ready for Anything” report surveyed 300 North American C-level executives across 10 industries to understand the emergence of Era I and, importantly, how prepared organizations are to manage this shift. The report found that 80% of financial institution respondents said their organization has experienced a trend toward consumers wanting a more individualized experience, and 43% have experienced this trend from employees – but only 17% give their organization an “A” in its ability to offer these experiences to consumers and 10% able to do the same for employees. Of a greater concern is that 71% of bank and credit union executives say the shift is a growing challenge in their ability to compete effectively. 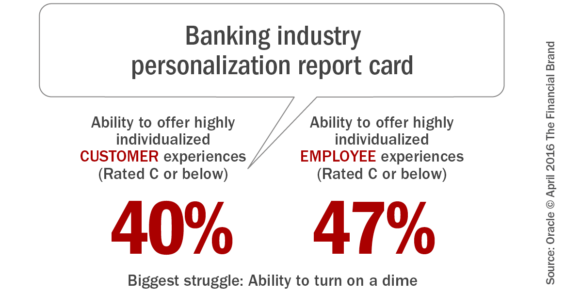 These findings are not unlike what was found in the Digital Banking Report, “The Power of Personalization,” which was sponsored by Personetics. In this survey of both consumers and financial institutions, it was found that banks and credit unions are not keeping pace with consumer expectations and are ill prepared to provide the level of customization and contextuality provided by other organizations such as Amazon, Uber, Apple, etc. The vast majority of financial services executives believe they are leaving money on the table by not being positioned to provide an individualized experience to customers and employees. But how much of an impact is it? According to the Oracle study, financial services organizations estimate that if they were able to successfully offer customers and employees a highly individualized experience, they would earn an additional 14% in annual revenue. For a $1 Billion bank or credit union, that’s $140 million a year in additional revenue. 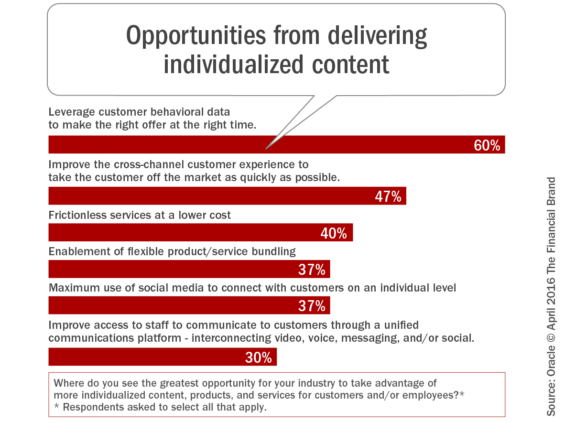 To achieve this level of revenue, organizations that took part in the survey said that ‘on-demand order fulfillment’ (80%), ‘self-service options from a device of choice’ (67%) and both an ‘intuitive online experience’ and ‘individualized content’ (63%) were key from a consumer perspective. Despite the significant revenue opportunity available to financial services organizations, most executives in the survey did not give their organization high marks for the ability to deliver on this opportunity. Not only did fewer than 20% give their organization an ‘A’ for individualized customer experiences (10% on the employee side), almost half gave their organizations a ‘C’ or below. It was found that the lowest grades were delivered by the largest organizations, with ‘the ability to turn on a dime’ mentioned as the biggest challenge by the industry overall. Nearly all organizations surveyed by Oracle (97%) believed investing in IT solutions would improve their ability to offer a more individualized customer and employee experience. This includes business intelligence tools and customer experience solutions. Overall, in order of priority, ‘operations’, ‘customer experience’ and ‘sales/marketing’ were thought to have the most significant need for IT modernization. 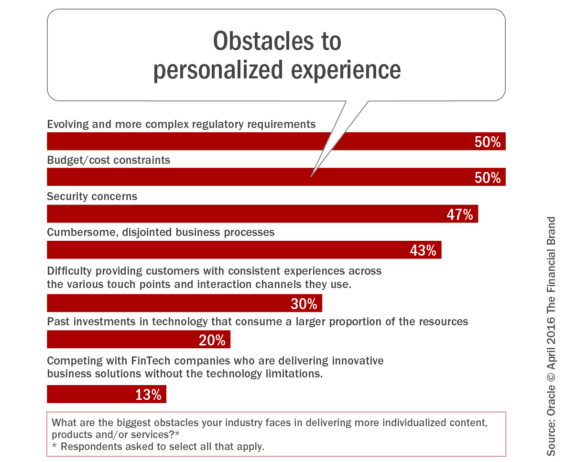 Not surprisingly, the biggest obstacles to a more individualized experience for both the customer and employee were thought to be issues around compliance and regulation (50%), budget (50%), security concerns (47%) and antiquated processes. In addition, 70% believed there is an important link between cloud-based IT solutions and their organization’s ability to deliver individualized employee and customer experiences. Unfortunately, the vast majority of financial institutions are stuck with legacy systems that were put into place as much as four decades ago. It has been customary for decades for strategic planning efforts to begin with the prior year’s plan, making modest adjustments on an annual basis to reflect changes in the marketplace. Not only is the concept of ‘modest adjustment’ no longer applicable, but even the concept of planning just once a year could be challenged in today’s highly volatile marketplace. Consumer and employee expectations are changing at a pace that traditional planning can’t keep up with. The time for ‘discussing what is needed’ has passed, and the time for action is now. At the foundation of creating a personalized experience is the application of the insight we have on both customers and employees. This goes beyond fancy reporting of what we believe is desired … it is the leveraging of this insight in ways the consumer and employee can feel. To keep pace, IT investments will be required both in the back-office and front-office. There is a lot at stake. Even from a conservative perspective, the ability to generate as much as $140 million a year for every $1B in assets should get someone’s attention. This article was originally published on May 5, 2016 . All content © 2019 by The Financial Brand and may not be reproduced by any means without permission.